Hello everyone! 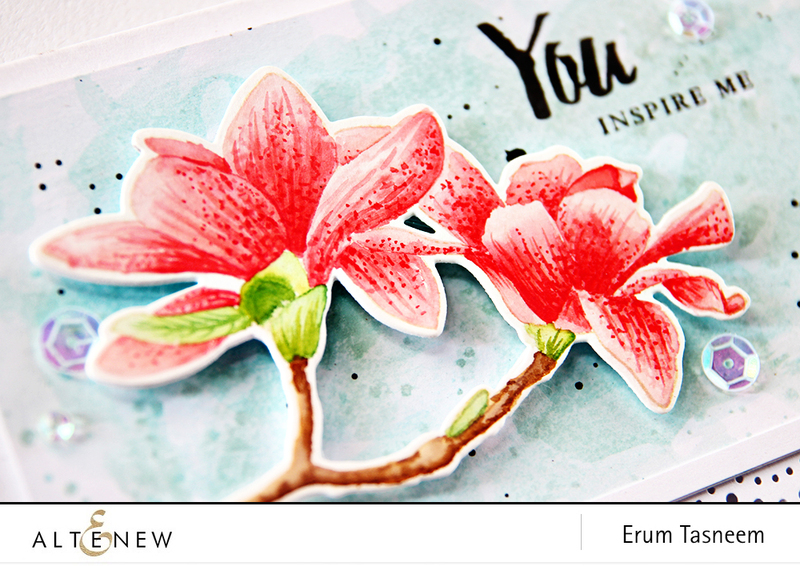 Erum here today and I have quite a few cards to share with you featuring the Build-A-Flower: Magnolia Stamp Set. 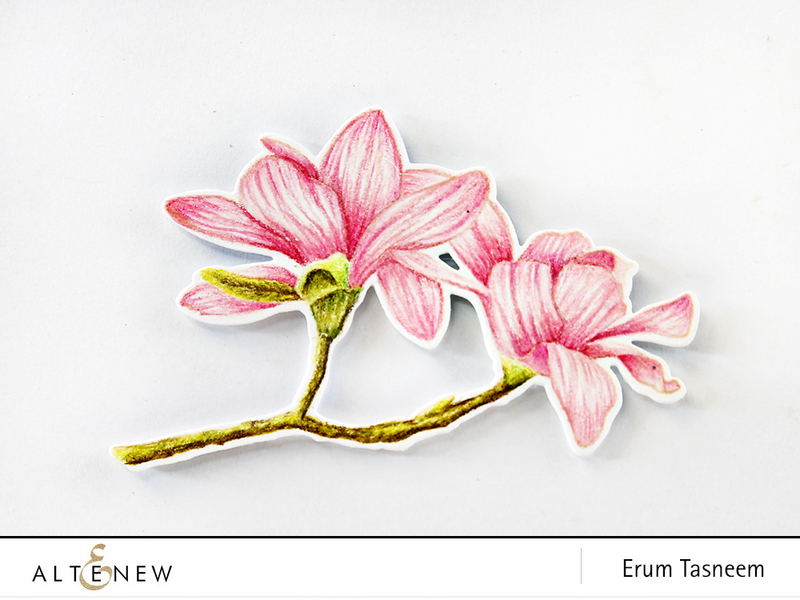 I love Magnolia flowers, they are fun to colour. Actually, the reason I made so many cards is because I wanted to show you different colouring techniques on one image. 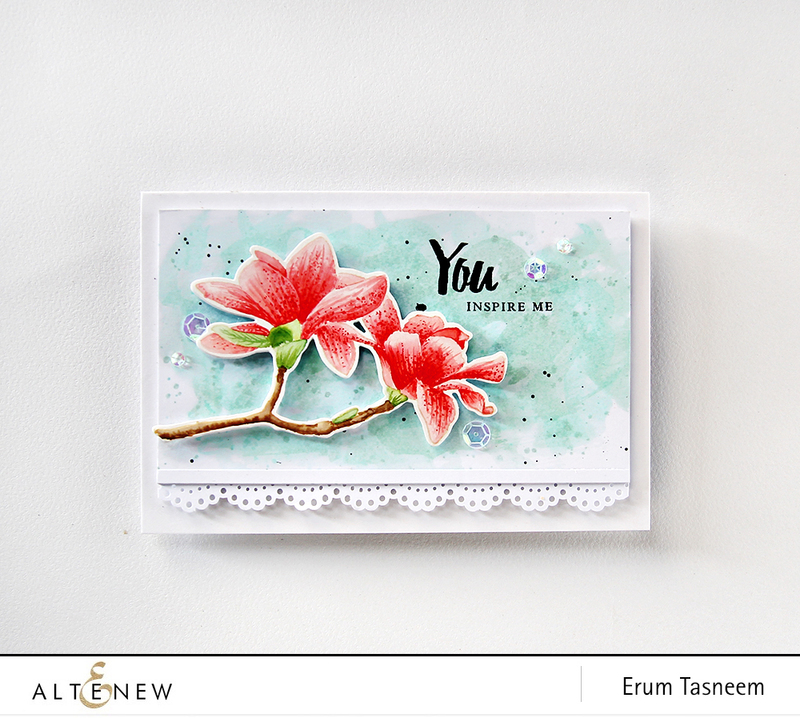 In addition to this, I will also be covering different embossing powders and showing you how they give the same image such variation. Therefore I kept my layout almost same for all my cards so there is little distraction and the image has all your attention. Also, every image I coloured/stamped , it was die cut using the coordinating die. 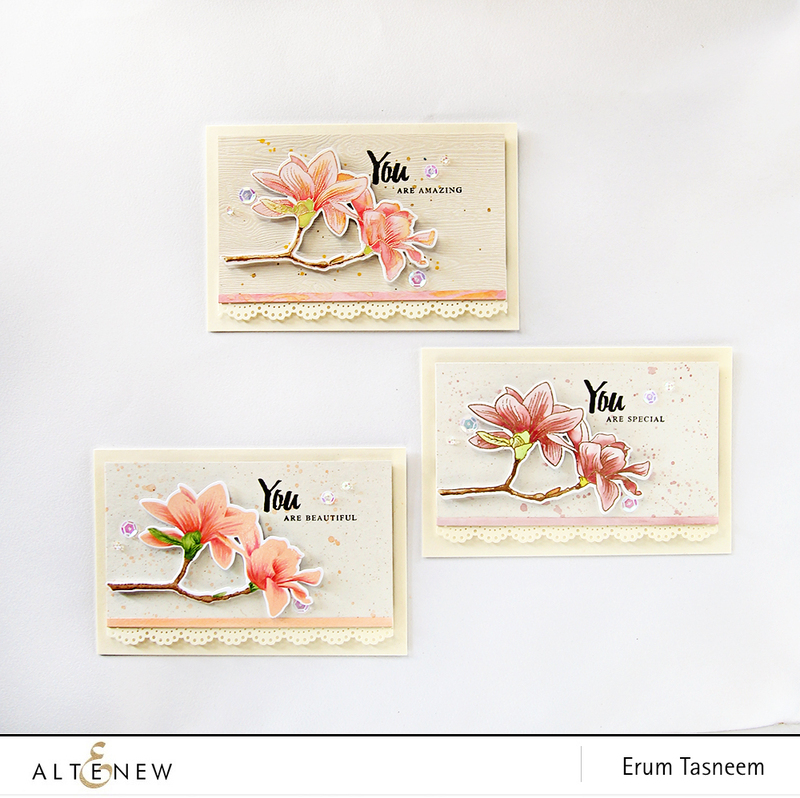 All sentiments used are from the same stamp set. 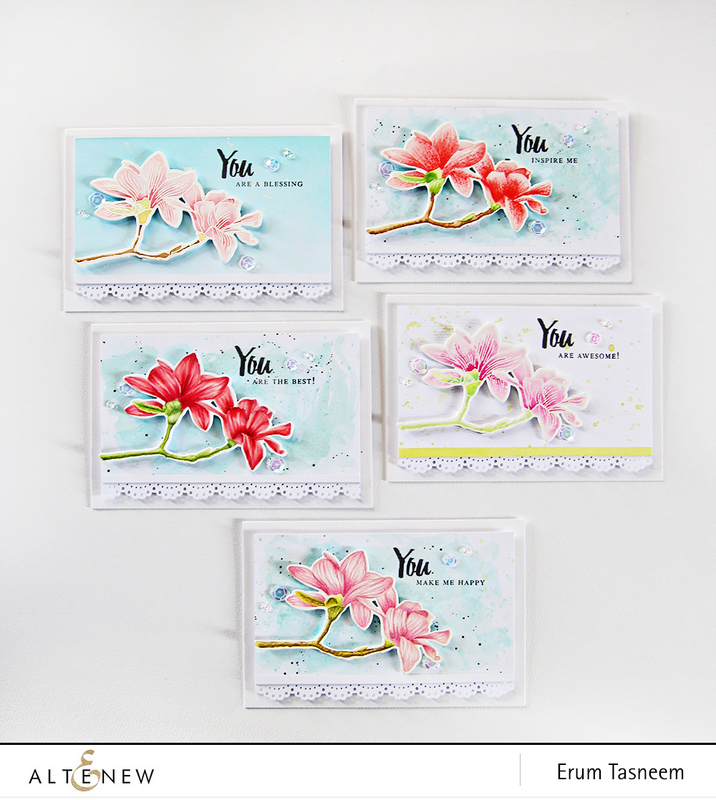 My cards today will show you the Build-A-Flower: Magnolia Stamp Set in eight different looks. However, since there are a lot of photos to go through, I will keep the description short. First up, no-line pencil colouring. I made a light colour wash panel for some of my cards. Here I used Prismacolors to colour my image. I stamped the image using Antique Linen distress ink. Next, some no-line water colouring. I have used distress stains to watercolour this image. Even though I didn’t need to add the details on this image to make it look different but I wanted to show you that you can add some specks or lines/strokes to change the look of the petals. Next, I have used Artist markers to colour my image. I have used Artist markers in Frosty Pink, Coral Berry and Ruby Red for my flowers. The stem/branch was coloured using Frayed Leaves, Forest Glades and Evergreen. Next up, stamping layering stamps. Here I stamped the layering stamps except for the outline stamp using Peach Perfect, Cotton Candy and Rouge Crisp Inks on Classic Crest Solar White Cardstock . I then went in with my colour pencils to add a few details. My front panel is cut from Spicy Yogurt cardstock. 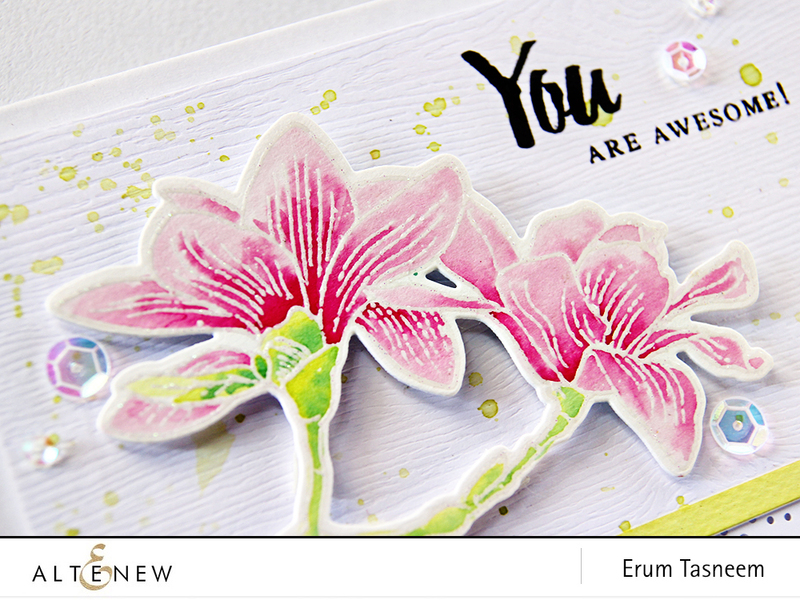 From here on my cards feature different Alenew Crisp Embossing Powders. First, Pure White Crisp Embossing Powder. Here instead of a colour wash background I inked the panel using Ocean Waves Crisp Ink. 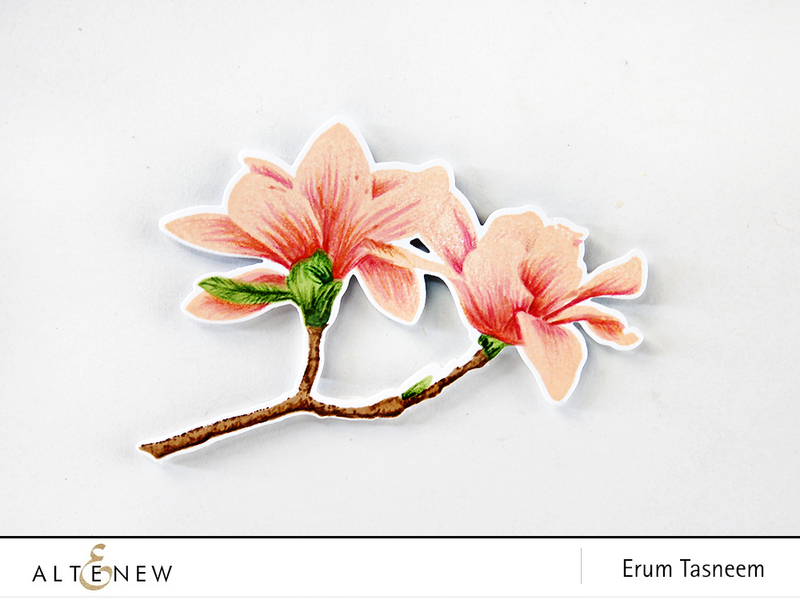 The flower is watercoloured using distress stains. Next, with Golden Peach Crisp Embossing Powder. For my front panel I have used Powder Woodgrain Cardstock. Here I have done some two tone watercolouring. Next with Translucent Pearl Crisp Embossing Powder. I have used Woodgrain sheet in white for my front panel. Lastly, with Antique Gold Crisp Embossing Powder. I have used Spicy Yogurt cardstock for my front panel. Watercoloured the image using distress stains. Finally, we are done! I hope one of these techniques is your cup of tea. 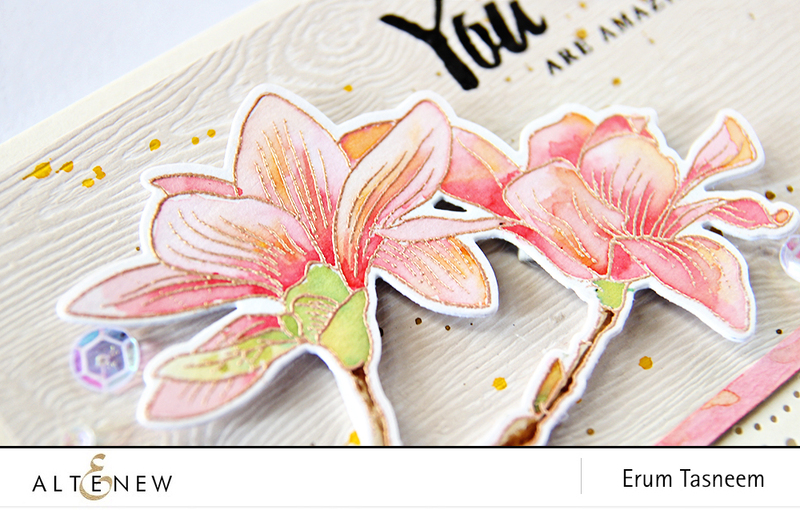 I’d love to see what you do with your Build-A-Flower: Magnolia Stamp Set. Don’t forget to tag Altenew or me when you share. Also, here are all the cards together. We have reached the end of the post, thanks a ton for sticking around. And to thank you, I will be picking out a name from the comments to send one of these cards out! A name will be picked from the comments left till July 3rd. I will announce the winner on July 4th here on the Altenew blog in my next post. 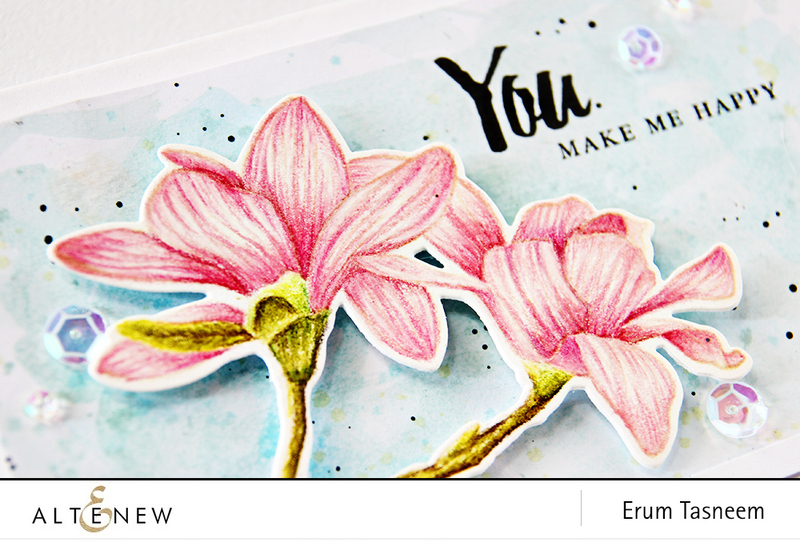 Create a Graphic Style Card with Ladies’ Day Out – Video! Thank you for showing all the embossing powders. They really are crisp. Love the extra white wite. Beautiful cards. Thanks for showing so many versions. I can’t even decide which one I love the best. They’re so beautiful. Your cards are all just lovely. I would love to get any of them, and JUly 3 is my birthday, so please choose me. Absolutely breathtaking cards! I love this set and use it often! TFS! Flowers are beautifully done! Lace edging is an elegant touch? 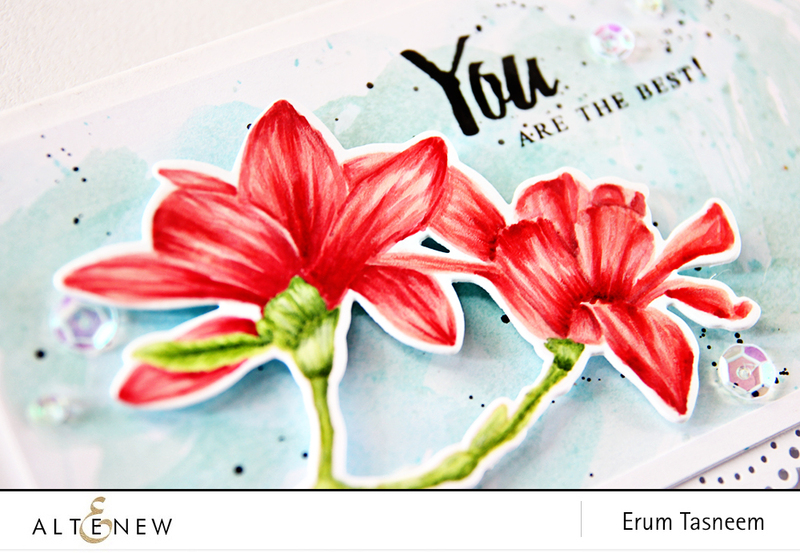 these are amazingly beautiful treasure of art Erum. . each and every piece is a true inspiration and a treat to the eyes..
Love the way you showcased this stampset…Different dimensional look just by coloring by different mediums…Awesome, Erum!!! I live next to a street called Magnolia Avenue, the street is 5 miles long and there are Magnolia Trees planted down the entire street. They are all bloomed and it is so beautiful, I love them. I also love the samples you have shared, they are amazing and have inspired me to definitely want this detailed and beautiful stamp set. 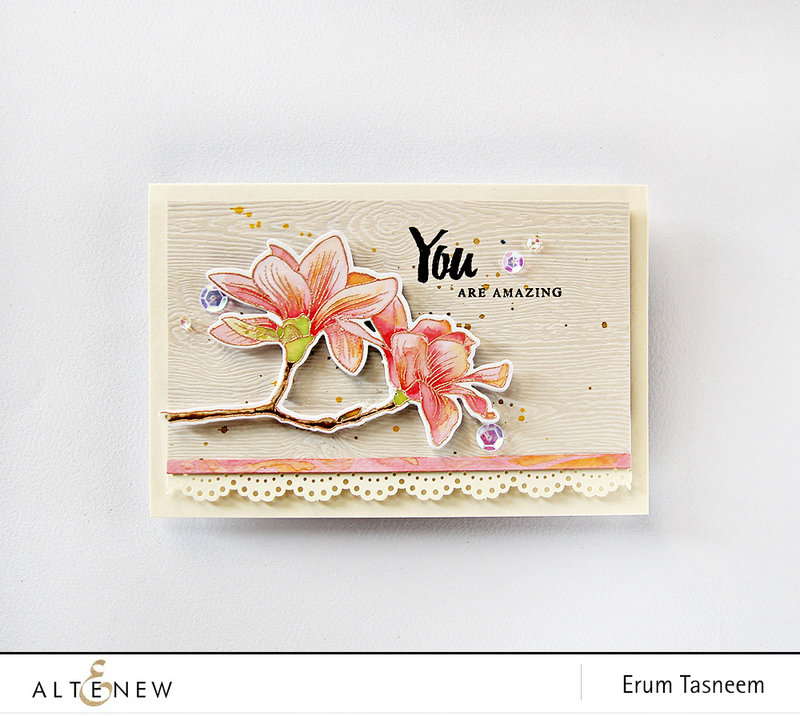 Thank you for sharing so many various creative ways of using this stamp set. Really beautiful cards! I love the colored pencil but then I love all of them! A very inspiring photo tutorial! Wow, what a stunning selection. All of the cards you have made are beautiful. Good luck to everyone for the giveaway. 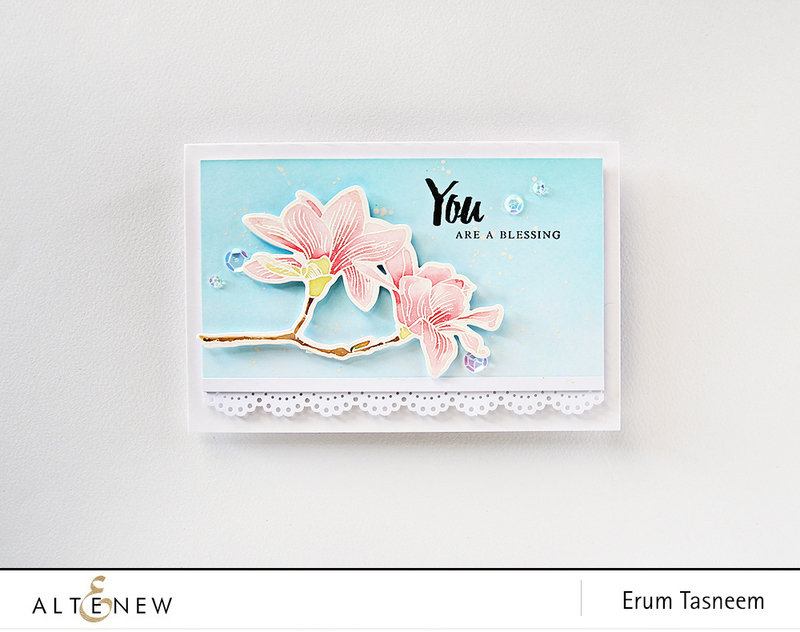 Thanks so much for sharing the beautiful cards, I luv embossing, adds so much depth to the card! God’s blessings! 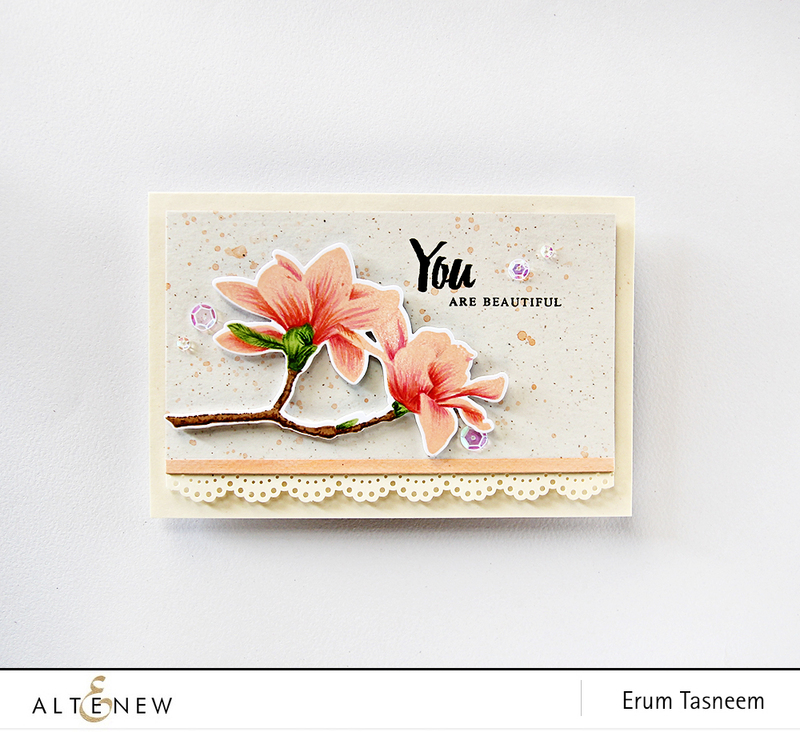 Beautiful cards – all! Embossing is pretty, but my favorite is the no line watercoloring. Thank you for make these beauties and for showing the different ways to create them. I have this stamp and now I am inspired. Thank you…your creative processs is amazing. Beautiful cards. Thanks for sharing all the different techniques and versatility from one stamp set. ERUM! 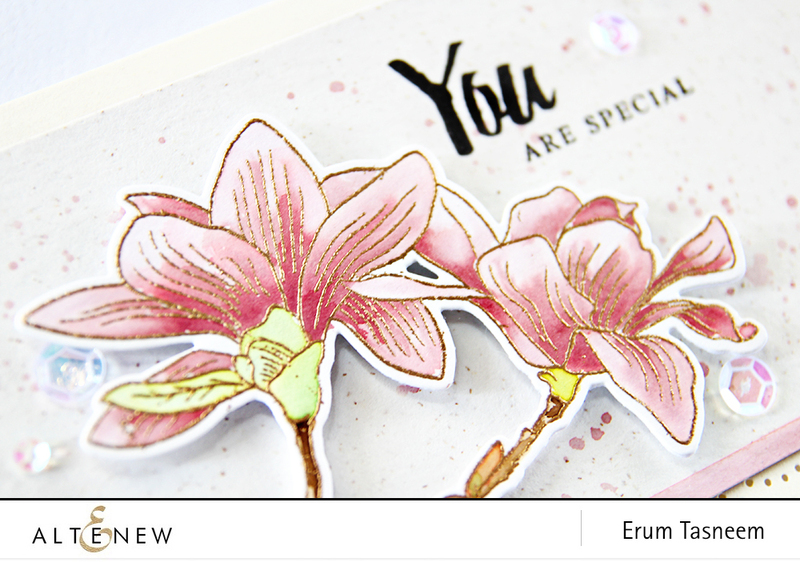 You have shown us not only how versatile your coloring skills are, but that the Build Flower Magnolia looks amazing in all colors too! Super Post! I appreciate seeing so many techniques – provides inspiration on how to get more use out of the stamps/die sets. Thanks! What a lovely collection!!! TFS – makes for a in-depth comparison of techniques…now to just pick one to try – LOL!!!! Beautiful collection of cards, Erun! 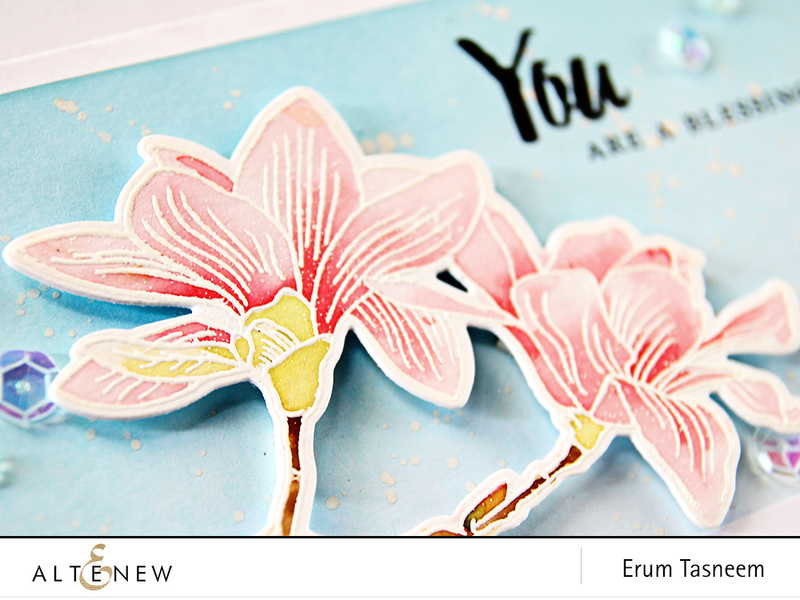 We have a lot of magnolias down here and each card you’ve created has so much realism and dimension! Thanks for showing us so many techniques! 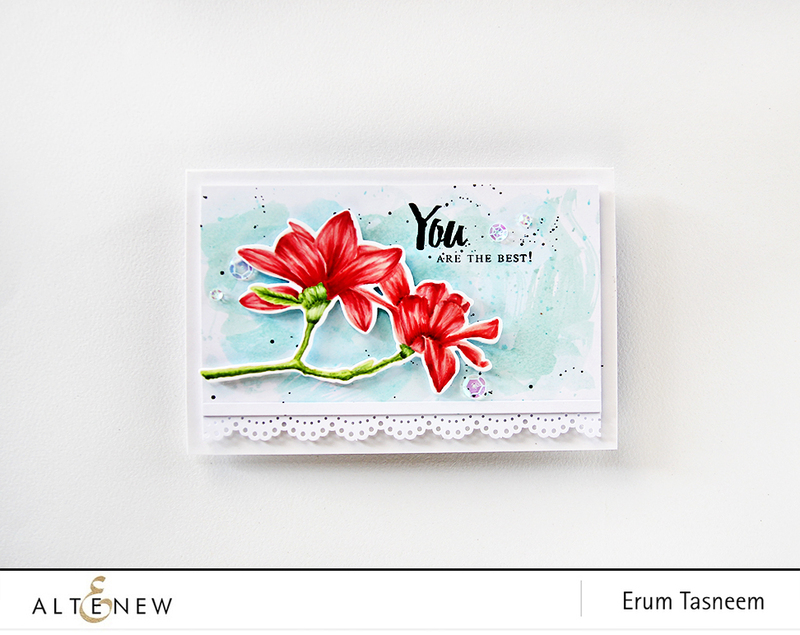 Erum, I wish that I could comment on each of your beautiful cards but you would stop reading the comment because it would be so very long as I lift out the beauty of each one. Your exploration of the techniques is exceptional. What a delight! And what a challenge for the rest of us to try to meet. It is such a good idea to stick with one stamp and then explore the possibilities. This is such a wonderful way to grow ones imagination Thank you for your gift and your inspiration. You are so sweet Jean. Thank you very much for taking time out to leave a comment. I love how you showed the different looks. You did a wonderful job. Thank you for showing us all the different ways to use this stamp. Oh these cards are so beautiful. It would be hard to chose which one I like best. I just love them all! Thank you for being such an inspiration! All cards r beautifil. U r such an inspiration. 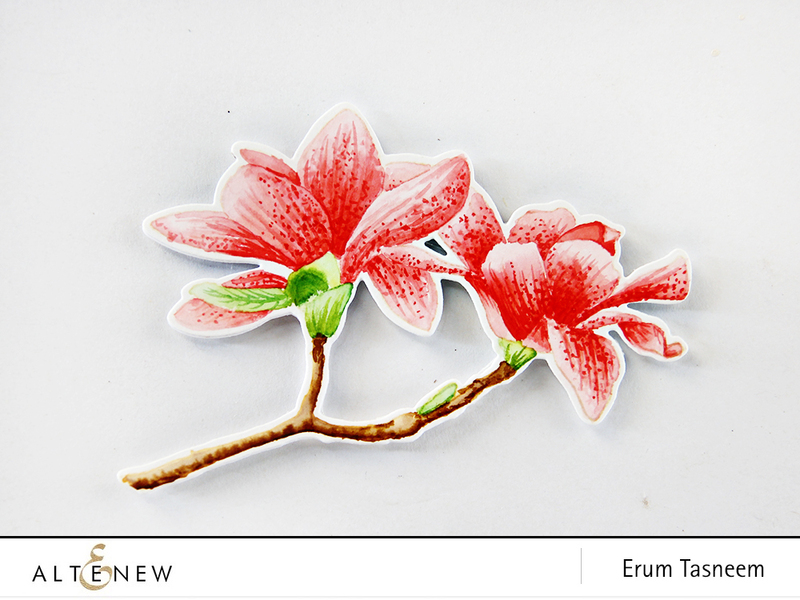 Lovely Erum. Thanks for sharing and inspiring me to take my paints and stamping tools again. Hugs. 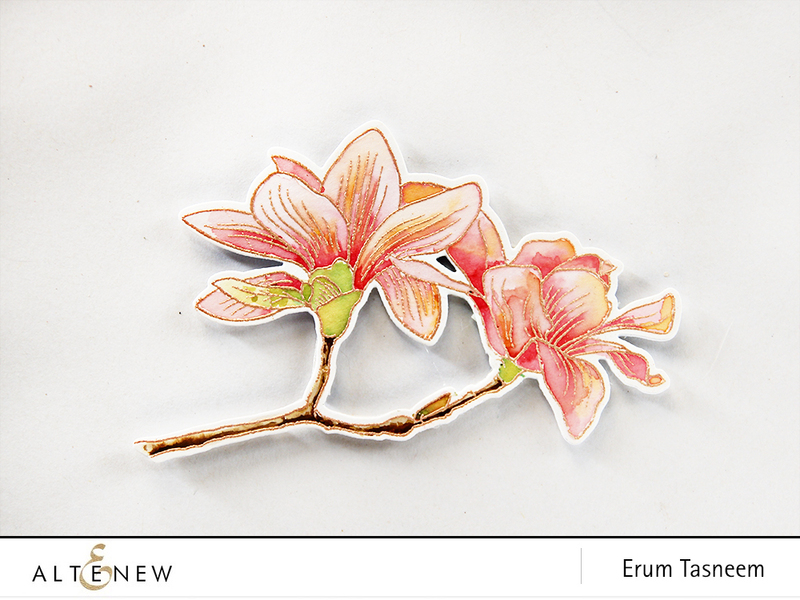 This is amazing dear Erum! You are such an inspiration! I love love love your work! I really like your blog post. Love to see all the different ways of coloring of the same image. Thank you for sharing this. Just one stamp set and so many gorgeous cards… Loved every single one of them..!! Thank you for showing so many different ways to use this stamp. All of them are beautiful and can be used so many different ways. I never would have thought to combine some of them so I can’t wait to try. 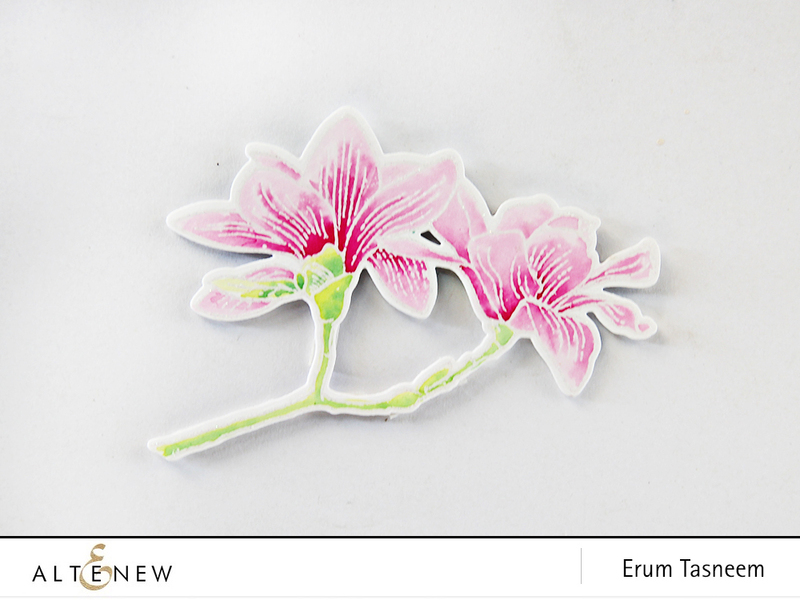 What an awesome post, Erum! I love every single card here and can imagine the amount of time spent to do this single post…. now, I want this stamp set and also a card! ;) hugs..
Oh my goodnesses! Each and every one of these cards is just lovely. I learn so much just looking at the shading you do on every single card you post. THANK YOU for sharing your artistry! You inspire! 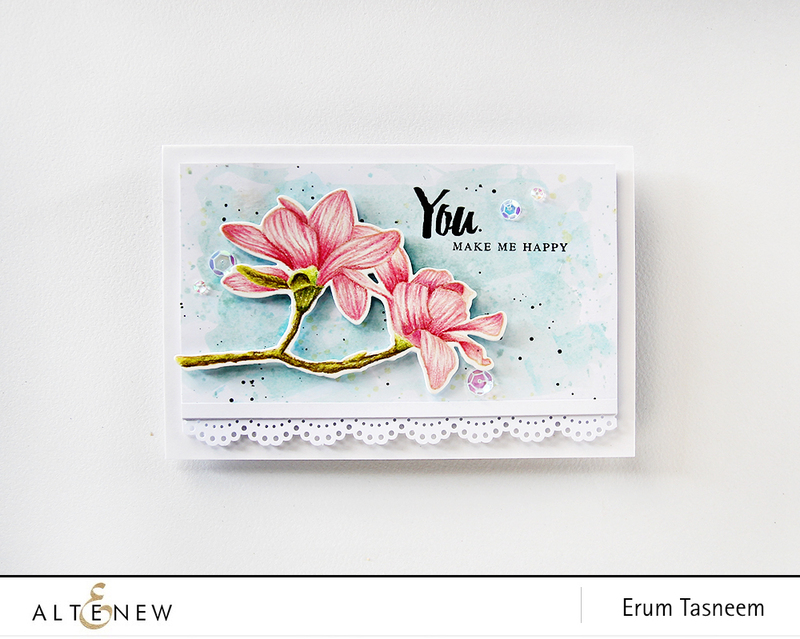 Each card is so unique, creative and gorgeous Erum! My wish list just got longer! Thank you for showing each card with a different coloring style. Each card is beautiful and it’s nice to see how the different mediums used create different effects with the same stamped image. Thank you for sharing these wonderful techniques. 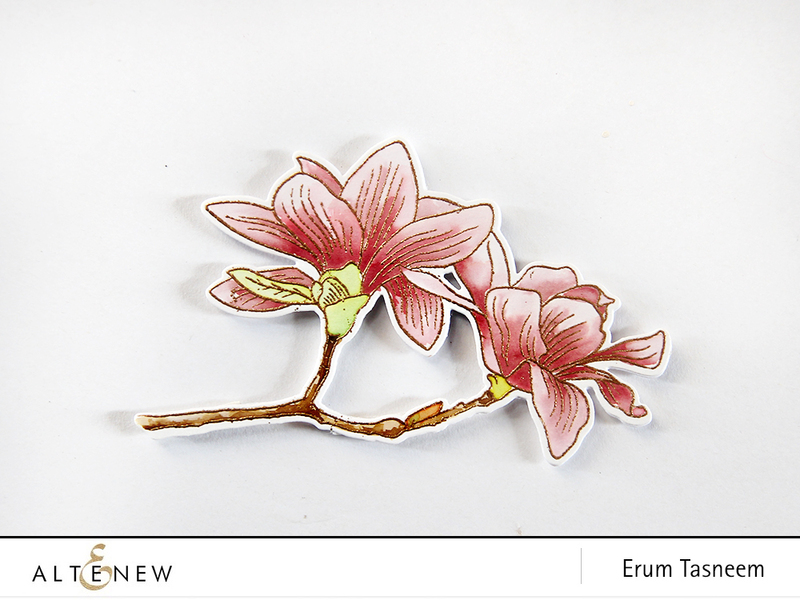 For the no-line watercolored image, did you add the details using color pencils? Thanks Saba :) No, it’s just watercolouring. love all the samples! thank you for taking the time to show so many variations! I think my wish list might break the Altenew site. LOL! Wow, Erum! Beautiful cards… each so unique with each technique! Thank you for taking the time to share the different looks made with each technique. It is so helpful! Always loved magnolias and wanted a tree in my yard, but still hasn’t happened. 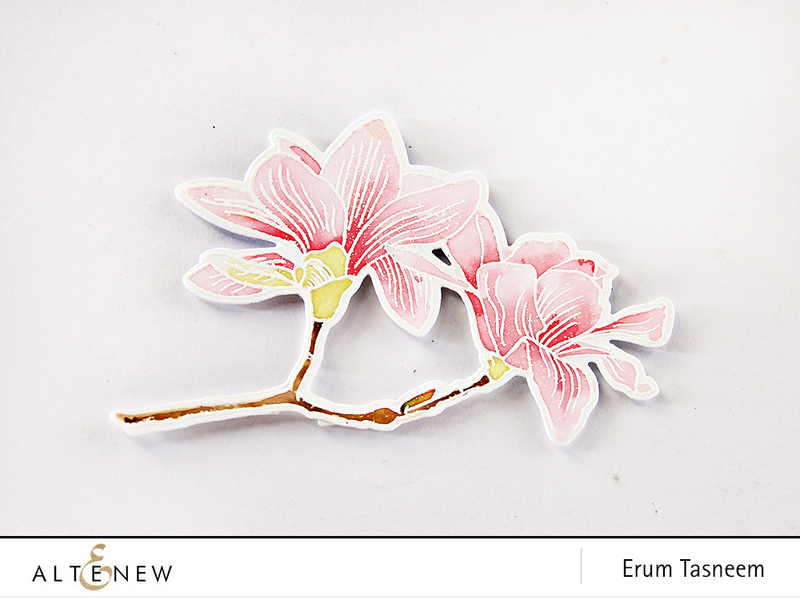 Erum, every single card is just stunning! 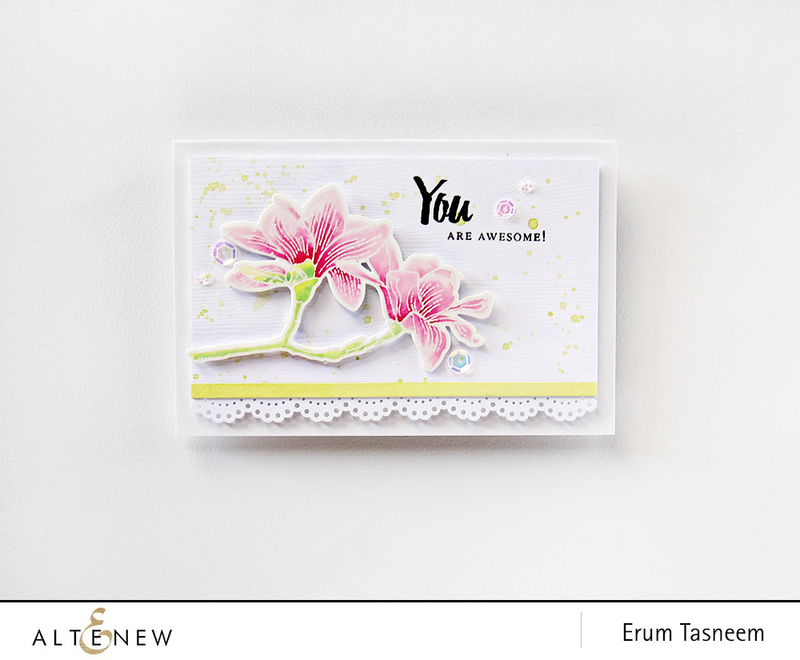 Appreciate you sharing so many different techniques along with embossing powders as each card is so very different. Glad you didn’t ask us to pick a favorite. I’d be happy with any one of them! 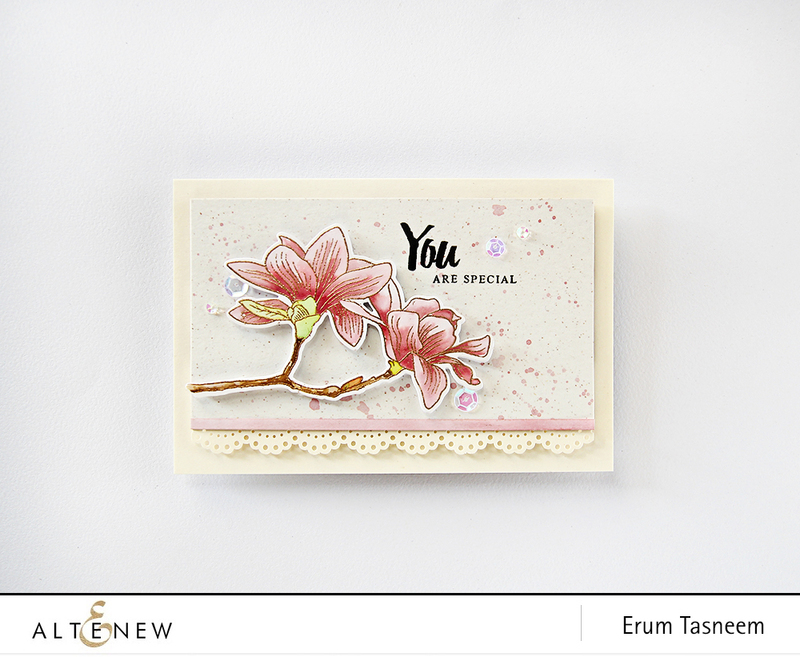 Very pretty flowers and a very helpful article, sometimes we get stuck on one technique, then put the stamp set away. This lets us use the same set in many ways to get lots of different looks. Thank you for posting this. I’d love to win that set, it’s very pretty. So many beautiful ideas; very inspiring. Thank you for sharing so many ways to use one set. What a treat for the eyes. 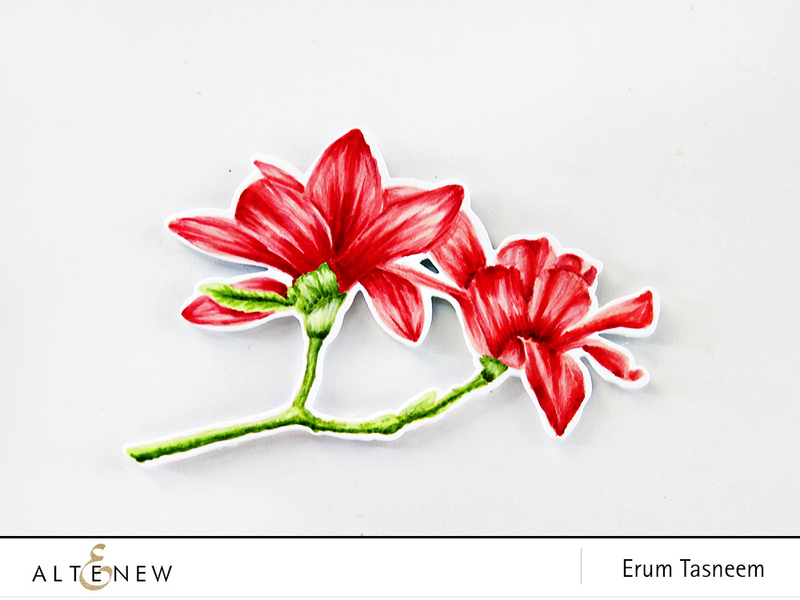 Erum you are so talented. They are all so beautiful, but I must admit my favorite is the Antique Gold on the Spicy Yogurt. It is so perfect in all respects. I have taken screenshots of all these fantastic ways you described here.. Wow.. just gorgeous! The layers when you built the card look so beautiful!